Just because it is your wedding day, does not mean you are allowed to do whatever you want. There are a behavioral patterns and etiquette for the bride and groom to follow on their wedding day. As you will be constantly under limelight you need to maintain the dignity and decency. 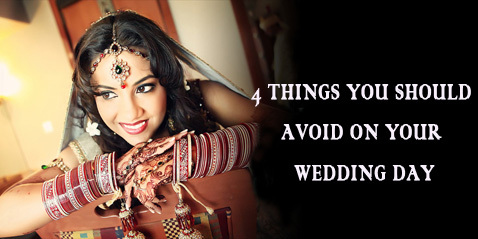 We have come up with a few out of the book guidelines on what a bride and groom should not do on their wedding day. Have a look. Yes! On your wedding day you will starve to death for hours because of all the rituals you need to follow. But, once you land on food, it does not mean you have to eat like a glutton on the stage. Eat, but eat limited because once on the stage, there will be hundreds of eyes concentrating on you. Therefore, avoid opening a big mouth whenever food is near. Pre-Wedding jitters are common in every individual. Every bride and groom has to go through it till they get married. It might be due to responsibilities or the fear of being the center of attention. Sometimes, a bride in India gets frustrated due to the heavy wedding dress and accessories she is wearing and at times is clearly visible on the face. In such a scenario be calm and think about how good you are looking. C’mon, it is your wedding day and you are no longer a bachelor or a bachelorette. Stop preying on the groom’s or bride’s friends. Since you are the center of attraction flirting with your would-be’s friends would only spoil your impression in front of your in-laws family and others. You will get your whole life to get intimate with each other. You need not do that in front of the public. Well, among Hindus, this point is more applicable as the bride is too shy to even look up. Holding hands is never acceptable in the Indian society.